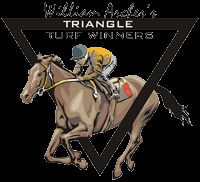 Welcome to William Archer's Triangle Turf page. Arch offers a concise analysis of all races available to the bettor from California, New York, Florida and Kentucky (subject to track racing schedules). In addition to the regular HANDICAP in which Arch isolates three logical contenders, each issue contains THE VERY POPULAR ARCH'S LONGSHOTS PLUS information on FIRST-TIME STARTERS, OVERSEAS HORSES and WORKOUT READY HORSES. ALSO, LOOK FOR ARCH'S "WHISPER" HORSE EVERY DAY AND OUR NEWEST FEATURE - FIRST-TIME REPORTED GELDINGS!